AMC's Great Kids, Great Outdoors: Go Away, Mrs. Thaw! 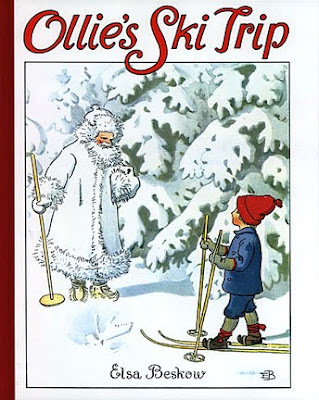 One of our favorite winter picture books is Ollie’s Ski Trip, written and illustrated a century ago by Elsa Beskow, who is known as the Beatrix Potter of Sweden. In the story, Ollie receives his first pair of skis on his sixth birthday. When the first snow comes, he skis into the forest, where Jack Frost notices Ollie's delight in winter and invites the boy to visit King Winter’s splendid ice palace. I've been thinking about Ollie’s trip today, because he and Jack Frost encounter Mrs. Thaw on the way to meet King Winter. Beskow depicts Mrs. Thaw as a blowsy hausfrau. Her galoshes squelch with every step, she blows her nose and sneezes as if she has a terrible cold, and wherever she goes, she leaves behind a slushy, muddy mess. Jack Frost roars at her to go away. Little Ollie, who has obviously been taught to be respectful to adults, is horrified by Jack Frost’s rudeness. The icy man explains: Mrs. Thaw is Winter’s cleaning lady. But she is terribly forgetful, and always shows up too early. The only way to keep her from ruining a good winter is to scare her away. Mrs. Thaw is making a mess of winter all over New England right now. Monday morning at Boston’s Logan Airport, the temperature jumped 12 degrees between 4 a.m. and 5 a.m. Much of the region saw between one and three inches of rain before nightfall, with especially heavy rain in the White Mountains of New Hampshire and Mahoosuc Mountains of Maine. Weather reports are talking about ice jams, high winds, and power outages. After Ollie returns from visiting the Winter King (our children especially like the polar bear guards), he follows Jack Frost’s advice for the rest of the winter, calling, “Mrs. Thaw, Mrs. Thaw, Please don’t sweep our snow away!” each time he goes outside. The refrain has become one of those bits of language that our family carries with us like an inside joke. Our kids want winter to go on for some time yet. We need to plead with Mrs. Thaw, as Ollie does, and ask that over-eager cleaner to take her busy broom someplace else until we’re truly ready for spring. Find Ollie's Ski Trip at The New England Ski Museum.